An inside look at fun things to do, places to eat and where to stay while vacationing in Seaside, FL! When people mention Scenic 30-A often times the most well known community in the area is the iconic town of Seaside. From shopping, dining, and entertainment Seaside always seems to be the center of attention and the place where everyone gravitates toward most. When visiting everyone tends to travel by foot, bike, or golf cart and leave their cars behind. 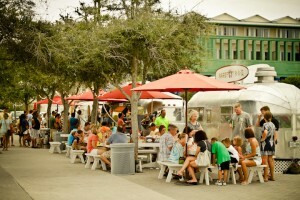 Upon entering downtown Seaside you are greeted by a variety of food trucks, boutique shopping, and the Seaside amphitheater where several concerts and events are often held. Visit Bud & Alley’s rooftop bar overlooking the beach and enjoy cocktails while watching the sunset or visit one of the nearby shops such as Modica Market for already-made dishes such as crab cakes, boiled shrimp, and sandwiches. Enjoy everything outdoors when visiting this charming Scenic 30-A town. Rent a bike and travel to nearby communities, cruise the many nature trails or explore all the shops in Ruskin Place. Travel to nearby Watercolor and paddle board, kayak, or canoe in Western Lake while enjoying incredible views of the gulf. On Wednesdays and Saturdays stroll down to the center of Seaside and visit the farmer’s market to explore all types of local vendors. When looking for a place to stay, renting one of the unique pastel colored cottages remains the most popular, however Seaside recently added a nine room property called “The Inn by the Sea” giving vacationers a more affordable way to enjoy their stay in Seaside. Interested in buying or selling your property in Seaside? Contact one of our expert agents today to learn more about Seaside property values and current market trends.